Who enjoys statutory preferred creditor status? What justifications exist for jurisdictions to maintain statutes that favour 'priority' creditors over other creditors and contributories? 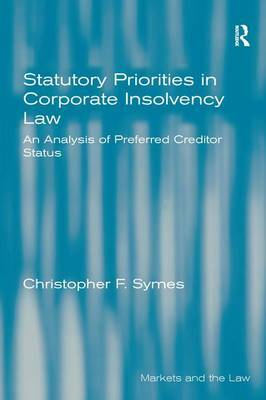 This book examines preferential debts derived from specific legislative provisions applying to corporate insolvency. In exploring the concept of preferential treatment, Statutory Priorities in Corporate Insolvency Law includes chapters that provide a doctrinal, theoretical and historical analysis of who enjoys preferred creditor status. As well as examining the traditional major categories of priorities, this work also identifies potential new categories for priority status such as environmental clean-up costs, international creditors, tort claimants and consumers among other non-consensual creditors. While the study focuses on Australian corporate insolvency law, where appropriate, comparisons are made with other common law jurisdictions, particularly the UK, Canada, New Zealand and the US.